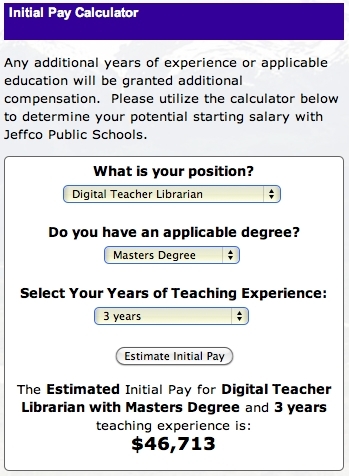 Jeffco Public Schools has added a crafty new tool to the website to attract new talent. Unfortunately, there’s no respect for the current talent in our district – just wait until you see these details! During teacher appreciation week, no less! The magical salary figures on the schedule that appeared out of nowhere at a Board meeting months ago, (no) thanks to the Board majority of Witt, Newkirk and Williams, now are being clarified by staff and available at your fingertips! 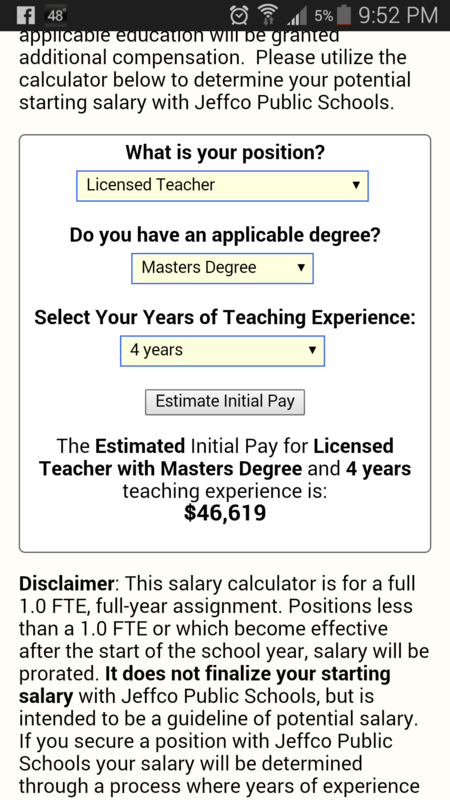 For instance, a teacher with a Bachelors Degree with 18+ years of experience can earn $52,601 – that’s $10,000 MORE than the current teacher with the same experience who put this information into the calculator! 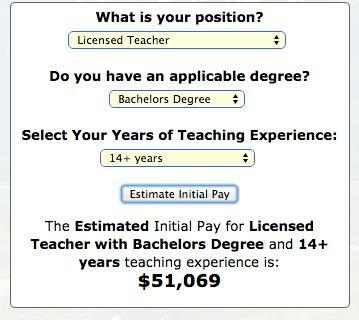 That’s a teacher who took a 3% pay reduction for two years to save teaching positions during the economic downturn! Maybe that’s not a good example, let’s see a few more! 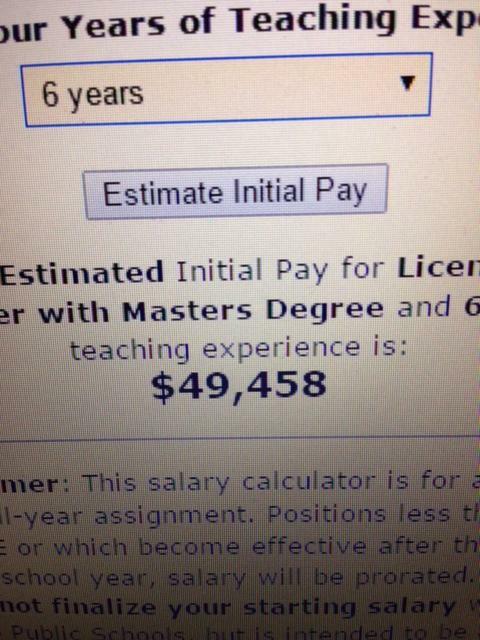 Here’s a teacher with a Masters Degree with 6 years of experience, $49,458. 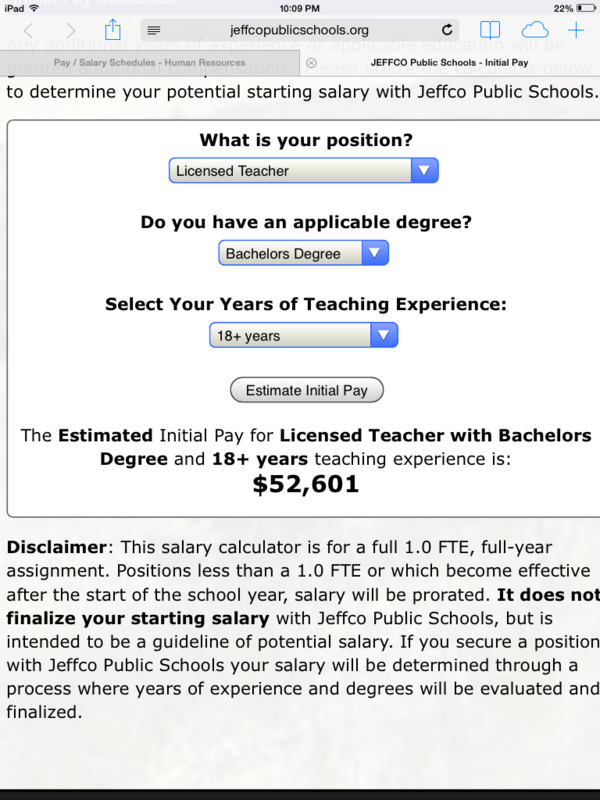 This current teacher makes $9,458 LESS than a new person coming to Jeffco. This next one shows true dedication! So there you have it, folks! Happy Teacher Appreciation Week from your Board Majority and the Magical Salary Fairy who forgot about your commitment to 86,000 kids, the 3% salary reductions, the lost retirement income, and the years of salary freezes. But we do welcome anyone new to Jeffco with open arms and bigger pockets! Synopsis – the Fact Finder that we, as Taxpayers, paid for (taking money AWAY from our children) agreed with the teachers! We appreciate teachers who Support Jeffco Kids and there are many thousands of examples of you in Jeffco! 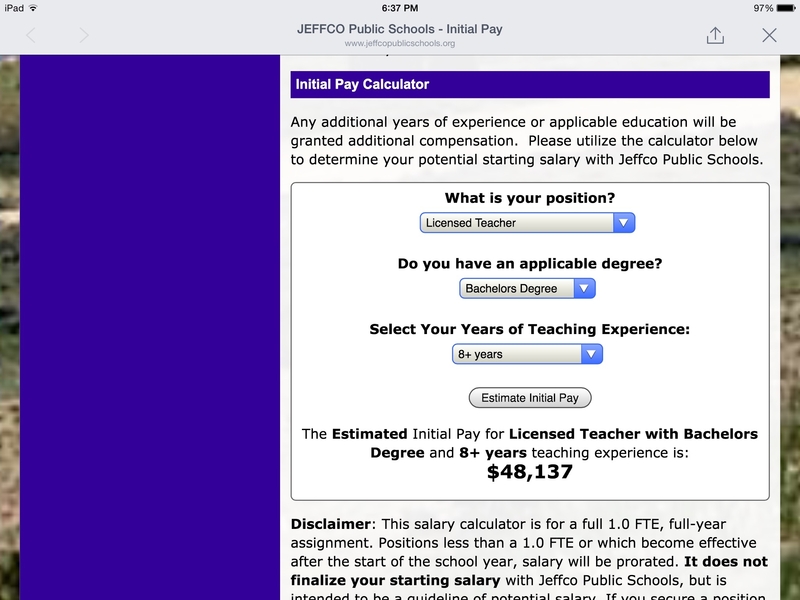 We also have a hard time believing that anyone in the Jeffco community would support this pay scheme. This is not the way we value the teachers who keep our children safe and who would put their own lives in harms way to protect them. Previous PostI didn’t start this fightNext PostWhat happens to our 86,000 children?